There is NO doubt about Ryan Couture as an elite MMA fighter that holds his own winning four in a row and his professional MMA record is now 6-1. The future is looking very bright indeed for Couture. Part of his success is backed by an amazing group of coaches at Xtreme Couture like (Neil Melanson – Head Grappling Coach, Dennis Davis – Pro Team & MMA Coach, Tim Lane – Striking Coach and Jake Bonacci – Strength & Conditioning Coach). Ryan controlled the pace of the fight all 3 rounds with good movement, quick hands and even a spinning back kick planted to the chest of Noons in the first. The only chance Noons seemed to have in this fight was in the second, but the conditioning and the Couture inside was not going to be stopped. Ryan finished the fight in a very active and aggressive pace with knees to KJs ribs and excellent striking that made round 3 easily Couture’s. This is what Randy Couture said this about the fight. If you want to get Ryan’s take on the fight check out his interview on Sherdog. Follow Xtreme Couture MMA on Facebook for news and updates. In the toughest fight of his career to date, Xtreme Couture MMA fighter Ryan Couture (3-1 MMA, 3-1 SF) got a visceral taste of Eddie Bravo’s grappling system three years ago as an amateur. Couture’s next opponent, Conor Heun (9-4 MMA, 1-2 SF), is one of Bravo’s prized students and should be an even bigger threat on the mat. But the Strikeforce welterweight is nothing like he was in his early days and looks forward to testing his skills against his more experienced opponent. Couture and Heun meet on the preliminary card of “Strikeforce: Tate vs. Rousey,” which takes place Saturday at Nationwide Arena in Columbus, Ohio. The fight airs live on Showtime Extreme while main-card bouts air on Showtime. Couture did just that in his most recent performance, which came after the first professional loss of his career. Three months after Matt Ricehouse outpointed him at Strikeforce Challengers 16, he defeated Maka Watson at Strikeforce Challengers 19, which halted a further slide. 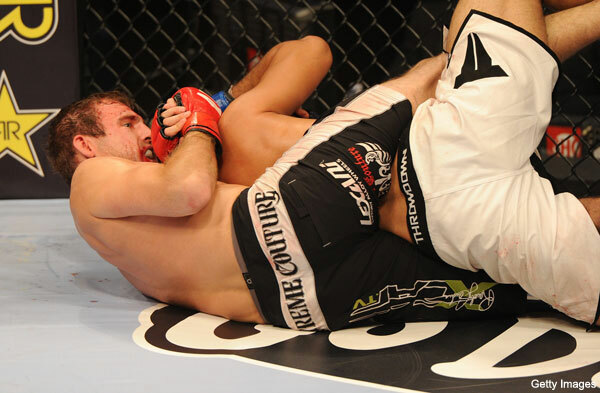 No stranger to the submission game, Couture has forced a tap from seven of his 11 amateur and professional opponents. Heun, however, represents a steep upswing in competition for the 29-year-old son of UFC Hall of Famer Randy Couture. 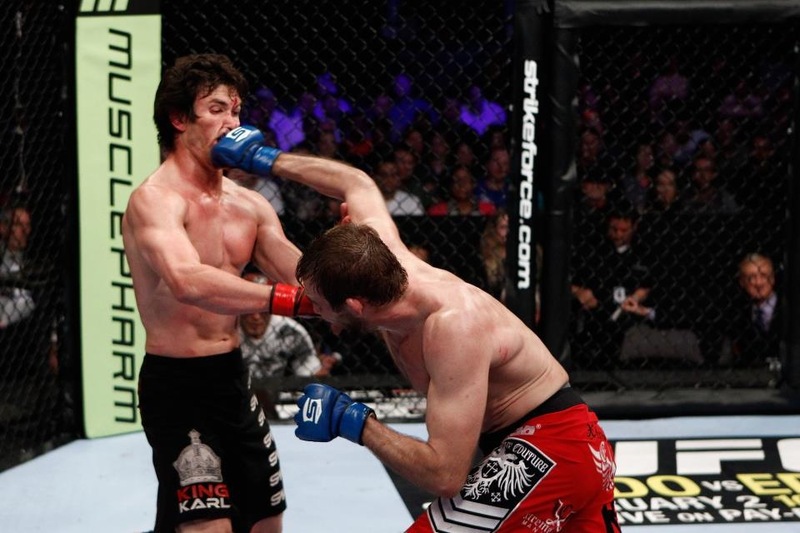 Despite his championship pedigree, Ryan Couture has built up his resume against competitors with a comparable number of fights. Heun, who’s a black belt under Bravo, not only has more fights on his resume but more high-profile appearances and high-profile opponents. Add to that a preternaturally tough disposition in the cage – in his most recent fight, Heun’s arm was gruesomely twisted by submission artist Mango Almeida, but he refused to tap – and you have a challenge that many might say is premature. Heun also hasn’t been shy about his desire to “destroy” Couture in competition. The laid-back Couture hasn’t paid too much attention to his opponent’s public musings, though he did catch one interview. Three years ago, Couture was choked out at the conclusion of a second round in a fight with Bravo student Sean Bollinger at a Tuff-N-Uff event in Las Vegas. He somehow rebounded and fought his way to a draw, but the experience taught him a valuable lesson in letting his guard down. But it also may come in handy against Heun. “I think that experience gave me some insight into their system and how they’re going to try and play me if I do end up in Connor’s guard,” Couture said. “I feel like I have a little better idea of what to expect. Thus far, Couture said he’s been winging it when it comes to his long-term career aspirations. A deep love for the sport has kept him in the game long enough to dispel notions that he’s piggybacking off his father’s success. Now it’s about how he continues to evolve and how far he can go. After his radio appearance, Couture was off to practice to rehearse scenarios he might encounter in the fight. It’s a sure bet that training partners locked him up in Bravo’s rubber guard. That may not be what he encounters, but it’s best to be prepared, anyway. When he steps into Nationwide Arena, it will be almost three years to the day since his father Randy Couture beat Tim Sylvia to recapture the heavyweight title at UFC 68. Back then, the younger Couture was just having his first grappling match with the challenges inherent to the sport. On Saturday, he’ll enter the cage a far more seasoned competitor. But make no mistake about it – this challenge may be his toughest. The 29-year-old Ryan Couture is just four fights into his pro career but all four have been on nationally televised Showtime cards. He was coming off a loss, but showed that he’s learning what his strengths are and playing to them. Couture was a solid high school wrestler and he’s taken his MMA grappling to another level, but when he lost to Matt Ricehouse back in June he relied too much on his striking. Friday, he went back to his bread and butter to score a split decision victory, 29-28, 29-28 and 28-28, and distroyed Watson by the final minutes of the fight. Couture (4-1) turned to his grappling from the opening seconds of the fight when he jumped on Watson’s back and got the fight to the mat. He controlled him on the ground and worked for various chokes for nearly four minutes. With 45 seconds left, Watson was able to escape and get top control. He got off a nasty elbow to slice open a bloody cut on Couture’s forehead. In the second, Couture once again got the fight to the mat and controlled things until two minutes left. This time when Watson, got top control he got off nasty elbows and most of his shots went unanswered. In third, Couture got it to the ground for the final 3:45 of the fight to seal the victory. LAS VEGAS – Strikeforce Challengers 19 fighter weigh-ins, where all but one of the evening’s 18 competitors made their bouts official. Main-event fighters Lorenz Larkin and Nick Rossborough each tipped the scales at 206 pounds. Today’s festivities, which were free and open to the public, took place in the Key West Ballroom of Las Vegas’ Palms Casino Resort. The Pearl, also located at Palms Casino Resort, hosts Friday’s card. The evening’s main card airs on Showtime. The only competitor to miss the mark was late addition Quinn Mulhern, who registered 176.5 pounds for his welterweight bout with Danny Davis. Mulhern has been given additional time to lose the remaining weight. Strikeforce Challengers 19 marks the promotion’s third event in Las Vegas. Beginning with July’s Strikeforce Challengers 17 card, the prospects-based Challengers Series events now take place at The Pearl at the Palms Casino Resort in Las Vegas. The company has already announced a Nov. 18 return to the venue for its final Challengers show of 2011. 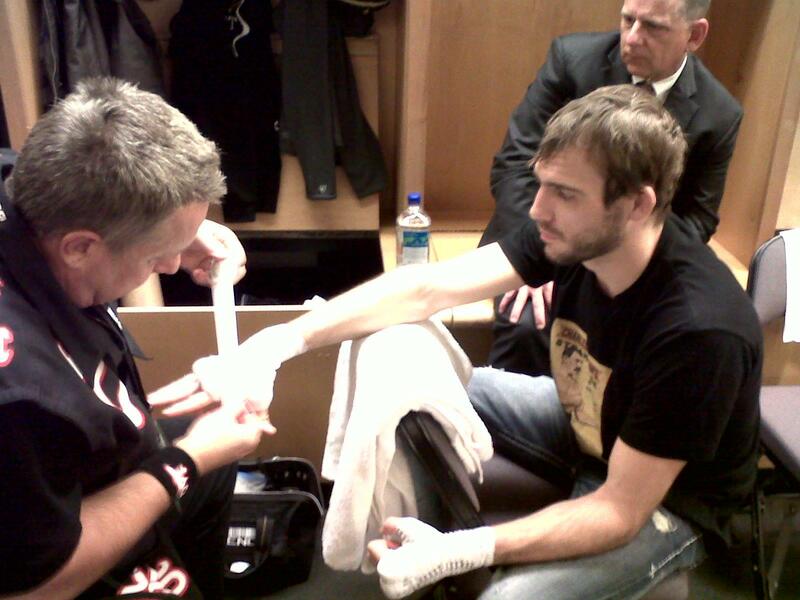 Ryan Couture returns to the cage – September 23rd. Xtreme Couture fighter, Ryan Couture (2-1 MMA, 2-1 SF), the son of UFC Hall of Famer Randy Couture, is scheduled to return at Strikeforce Challengers 19, which takes place Sept. 23 at The Pearl at the Palms Casino Resort in Las Vegas. The event’s main card airs live on Showtime. The 28-year-old Couture’s rise was temporarily halted when Matt Ricehouse outpointed him in June at Strikeforce Challengers 16. Prior to the setback, Couture had racked up two wins against Lucas Stark and Lee Higgins, which built on a 5-1-1 amateur record. On a bright, windy June afternoon, two middle-aged men pop out of a gargantuan Ultimate Fighting Championship promotional trailer in the parking lot of the Palms and instantly begin bubbling like a couple of star-struck teens. They’re old enough to have abandoned hero worship years ago, but the two are in a tizzy, having just met one of the most promising young stars of mixed martial arts at today’s UFC promotional event. Fan No. 1 is built like a linebacker, with slicked-back dark hair and a T-shirt that ominously reads “Annihilation.” His buddy, who looks to be about the same age, is slightly less beefy and sports a similar hair set-up but no intimidating wardrobe choices. These two would look more at home on a golf course, or shopping together for cement at Home Depot. The fact that they are, instead, comparing their new, glossy, autographed photos of UFC up-and-comer Ryan Couture is both funny and a bit perplexing. What is it about this young fighter that’s dragged these two average guys out of the suburbs on a day when most men their age would take advantage of the great weather to play with the kids, shop with the wives or squeeze in nine holes? Mr. Annihilation, as if on cue, inadvertently explains in a husky voice to his friend and anyone else within earshot. “He’s got some guns on him, now,” agrees Less Beefy. Fifteen minutes later, the 28-year-old Couture takes a break from signing autographs and walks out of the trailer to chat with a reporter. The intense, subsurface slow burn that normally characterizes Couture’s features breaks into a wide smile when asked if he’s gotten used to affecting fans, many of them middle-aged dads, like this. “I love the fans,” he says … and that’s it. Couture just stands there and smiles, waiting for the next question. Hmmm. It’s obviously going to take a little more to get this guy to open up. Time to downshift into personal history. Asking about his former life as a banker in Bellingham, Wash., when he was fresh out of Western Washington University with a newly minted degree in mathematics, seems to do the trick. So, the 5-foot-10 Couture, who weighed about 200 pounds back then, in 2008, left his Washington bank job and moved to Vegas to train at a local gym owned by his dad, who also helped launch his son’s professional fighting career. That sounds cool enough before you realize “Dad” is Randy Couture, the 47-year-old mixed-martial-arts legend and UFC Hall of Famer who has held the UFC heavyweight title three times and the light-heavyweight championship twice. Father and son have remained close throughout Ryan’s life, he says. Even after his folks split when Ryan was in the sixth grade and he stayed behind in Washington state with his mom, Couture says he and his dad kept in close contact. Ryan has told reporters before that he knew Randy as just Dad, not as a major fighting star. The family moved around in Ryan’s youth, from Germany to Oklahoma to Washington state, but Ryan says his dad was there as much as he could have been, goofing around with his son during down time from the road. Now that father and son are together again, both have had time to catch up. “We always kept in close touch, but living here in Vegas has given us the chance to reconnect,” he says. Although Randy is often out of town gilding his already illustrious credentials, Ryan says they spend time together as much as they can. He says he never thinks about his dad the way the fans do, but he’s learned from Randy how to handle his newly chosen career and the glaring spotlight that comes with it. “I’ve never known any different. For me, he’s always been Dad. Because people didn’t always know who he is, it’s been interesting to see his transition, and that’s given me tools to deal with what I potentially have in store with my career,” Ryan says. Although at vastly different stages of their respective careers, Ryan says he and his dad share a lot, namely a trademark family passion they bring to the sport. “He’s always been a competitor, he was a wrestler growing up, so in that regard his approach has always been very intense,” he says. Intense just like the son. Randy agrees with Ryan’s characterization. His voice swells with pride as he talks about his son. “I think personally, we’re very similar. We’re very laid back, not high-strung individuals, and we both have a diligence about us, a work ethic. It’s how we’re hard-wired, I guess, so those are definitely traits we share,” says Randy, taking a break from a business trip in Los Angeles. Ryan obviously loves sharing so much with his father: the intensity in their training, the commitment to winning every bout, the father-son time Ryan’s move to Vegas afforded them. He again breaks into a grin as he talks about how he thinks his dad sees him. “I think he likes to see I’m in the gym putting in the hard work, and as long as he sees I’m doing things the right way, he [doesn’t offer advice],” he says. That right way of doing things has served both Coutures well. In addition to his titles, Randy enjoys an 18-10 professional record while Ryan is, so far, 2-0. Come June 24, Ryan will face undefeated fighter Matt Ricehouse at an event in Kent, Wash., sponsored by UFC affiliate Strikeforce. “I’ve been doing two-a-days getting ready for the past five weeks, and my training has been really sharp, really great,” he says. “I like the way I match up with Ricehouse. We have similar styles, we’re both kind of long-ranging and well-rounded fighters. It’ll be a good test for me, but I think I’ll be able to isolate him,” Ryan says. As the two have grown closer in the past several years, as the father has imparted his body of hard-knock knowledge to his up-and-coming son, Randy says he, in turn, has learned important lessons from Ryan. “I think Ryan seems to be a little more calculating than I was. I was a little more rash when it came to some things, but he is a little more reserved. I’ve watched him, and I’ve learned from him,” says Randy. No matter what happens on June 24, win or lose, Ryan says he’s not going anywhere. Mixed martial arts, not the daily grind at some bank, is what feeds his soul. That’s most important, says Ryan: doing what you love. Ryan Couture, son of UFC Hall of Famer Randy Couture, will be returning to the cage come this June when he returns to the upcoming Challengers card. He will be returning to take on Strikeforce newcomer Matt Ricehouse, an undefeated lightweight prospect who will be looking to put the first blemish on Couture’s budding career which has recently picked up a lot of steam now that he has recorded back-to-back wins under the San Jose banner. The event, “Strikeforce Challengers 16″, takes place on June 24th at the ShoWare Center in Kent, Washington. Couture will be looking for his third win in a row in as many appearances with Strikeforce when he takes on Whitehouse this June. In his last outing, Ryan showed the full gauntlet of his skills, when he was able to knockdown Lee Higgins with a crisp right hand after setting him up with low kick combinations all night. Next, Couture was able to capitalize off of a takedown when he eventually sunk in a rear-naked choke with just 19-seconds in the bout. Now, Ryan will be taking on 4-0 prospect Ricehouse will benefit with the signature win over Couture and will utilize the opportunity to make a name for himself in the mixed martial arts world. Matt was last inside the cage when he met Tom Aaron under the Strikeforce banner last December, where Ricehouse dominated the bout from start to finish en route to a decision win. A win here will propel Couture into more competitive and name opponents.